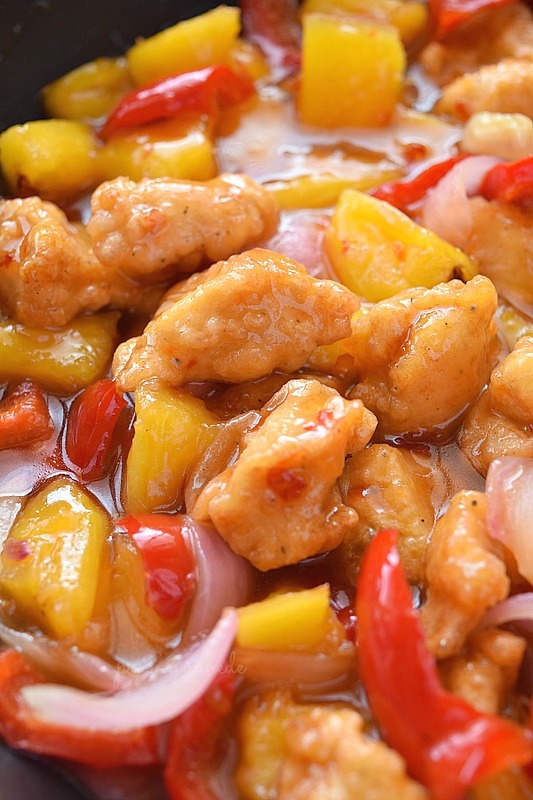 Panda Express Copycat Sweet Fire Chicken! Easy dinner/Lunch fix and restaurant style food at home. 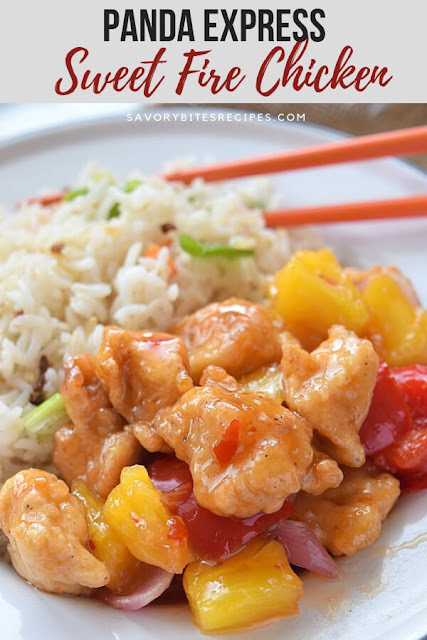 I am a HUGE Panda Express fan and love almost everything on their Menu.This Sweet Fire Chicken Breast Recipe is perfect and is so close to the takeout. 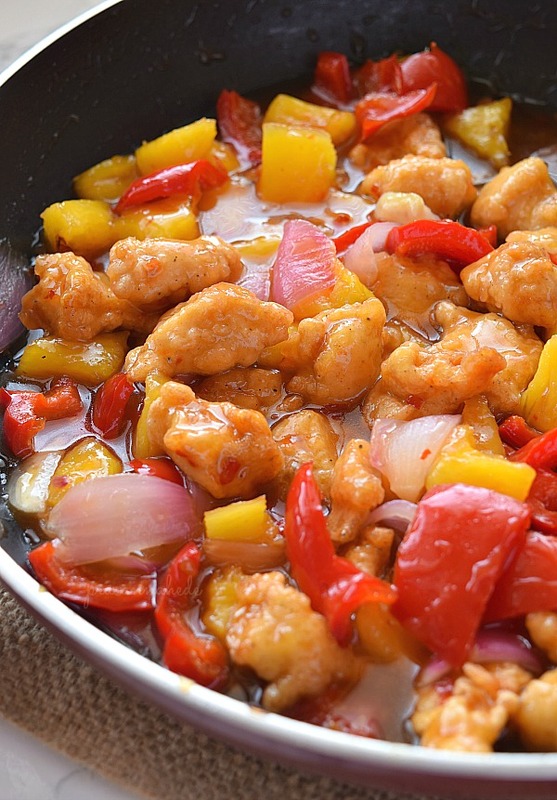 Soft and delicious Chicken chunks cooked and tossed with sauces,pineapple chunks,onion and bell pepper makes this perfect to go with any fried rice or sticky rice. 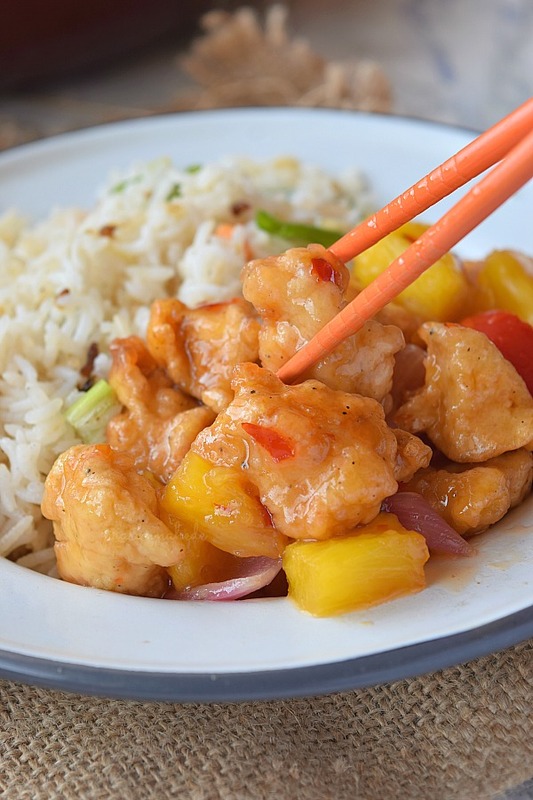 If you are a lover of Panda Express Recipes then you will find many more here. This is very easy to put together. The choice to whether fry the chicken or bake it is personal,but either way works fine. I chose to fry the chicken as I wanted to reserve some fried chicken pieces aside to just munch like popcorn. The key ingredients in this Sweet Fire Chicken Breast is Thai Sweet Chili Sauce. Yes, this recipe is very basic and with minimal ingredients and the only main ingredient is Thai Sweet Chili Sauce. Also the sour pineapple chunks complement this sauce very well. Marinate the chicken pieces which are cut into 1/2 Inch thick chunks, with egg,salt,black pepper powder,cornstarch and APF. Either deep fry or bake in oven till chicken is cooked well. I have fried the chicken pieces. 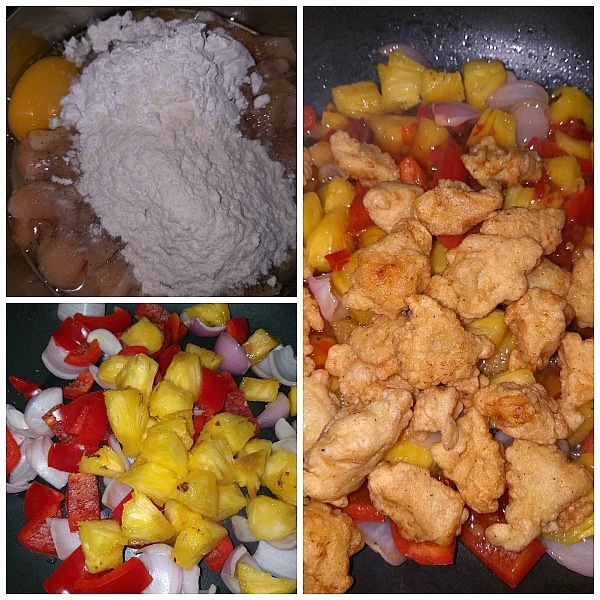 In a pan,add oil and fry the red bell pepper,onion,pineapple for few minutes till the pineapple is slightly firm but make sure do not does not start sweating. Add the sauce and mix well. Mix cornstarch with water and add to the sauce mix. Toss well and cook till the sauce is thick and serve with side of your choice. 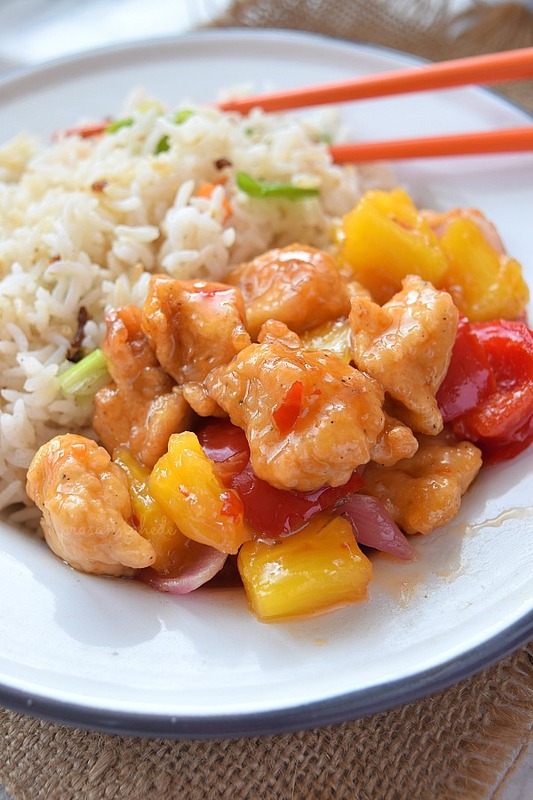 Panda Express Sweet Fire Chicken Breast - so easy to make at home and enjoy with delicious fried rice or noodles of your choice. Firstly,clean and cut the chicken into 1/2 Inch thick chunks. Marinate with the ingredients mentioned. In a Cuisinart Pan add oil around 2 Inch,enough to cover the chicken pieces when dropped to fry. When the oil is hot,add the chicken pieces in batches and cook till done. Drain on kitchen paper with Stainless Steel Spider Strainer and keep aside. In a pan,add a Tbsp of oil and saute the veggies and pineapple chunks. Make sure they do not sweat as the final sauce will be watery. Add the Thai Sweet Red Chili Sauce ,salt,sugar and cook for some time. As the sauce is almost getting thickened,add the chicken pieces and cornstarch mixed with water. Toss well and cook for sometime till almost dried. Serve hot with fried rice or noodles of your choice. Oh yes..That's a good option too. Thanks for dropping by!